There’s been rumors of a new Addams Family film being planned. I’m not sure what they’re going to call it – a remake, a reboot, a continuation….etc. I guess it doesn’t really matter, the point is that the creepy family will be back on screen to introduce themselves to a new generation of fans. The last time the family was onscreen was in 1991’s film and the 1993 sequel Addams Family Values. Along the road there was a failed attempt at a new television show too. Interest in a new Addams Family film I suspect will only grow as the Broadway musical attracts audiences attention. Obviously, there will be a recasting of the roles from the previous films. Raul Julia passed away in 1994. Christina Ricci is way past Wednesday Addams age. Anjelica Huston and Christopher Lloyd wouldn’t seem too likely to want to reprise their roles even if they were asked. So a new film version will probably be an all-new cast and filmmakers. Immediately when I read about this, one filmmaker leapt to mind – Tim Burton. With the macabre nature of the material and his penchant for oddball films it would seem like a perfect match. One of his first films was Frankenweenie, the story about a boy who brings his dead dog back to life. That sounds like it would be something Pugsley would be doing in the backyard. When Burton’s last film, Alice in Wonderland came out, everytime I would read an article about it there was always a mention of his favorite leading man Johnny Depp. A look back at their collaborations, their working relationship and their best and worst films their partnership has yielded. So if Burton were to direct The Addams Family who would seem like the ideal candidate as Gomez Addams? Now this prediction is nothing special. 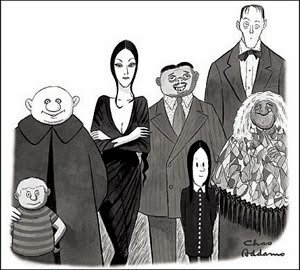 Already Addams fans have started discussing this matchup of Burton and the dark comical world created by Charles Addams. It would seem like a perfect match. But then again I thought the same thing when Burton was announced to be the director of the remake of Planet of the Apes.